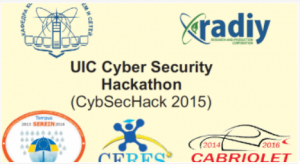 During November 6-7, 2015 at department of computer systems and networks of National Aerospace University n. a. N. E. Zhukovsky «KhAI» the first in Ukraine open student hackaton Cyber Security Hackathon CybSecHack 2015 was organized. distributed web and cloud systems. Workshop and training during which the leading specialists from RPC Radiy and specialists from department of computer systems and networks of National Aerospace University n. a. N. E. Zhukovsky «KhAI» gave talks on issues, tendencies, technologies and solutions in the field of cyber security of embedded industrial systems based on FPGA and MP. All participants (more than 50 people) received certificates.